Pricing for bonds that are traded on an organized exchange such as the US Treasury are published in many financial websites that have tickers as well as newspapers. The relevant information includes the bond price (quote), contract rate and effective market interest rate (yield). Bonds that are traded on an exchange make up only a small percentage of total bonds that are traded between organizations and investors. To calculate the price of bond issues, we will apply present value concepts. This will be accomplished by using bond pricing tables and through calculation of present value of a bond’s cash flows. The effective market interest rate is used to find present value of a bond and the contract interest rate is used to calculate the cash interest payments produced by the bond. To illustrate calculation of present value of a bond discount, consider a company announces offer to issue bonds with a $1,000,000 par value at 6% annual contract rate with interest payable semi-annually and a 3 year bond life. The current effective market interest rate for this bond is 8%. What does this mean? This means that since the contract rate (the interest rate the company will be paying to bondholders) is less than the effective market rate, the bond will sell at a discount. When calculating the present value of this company’s bond, we will work with semi-annual compounding periods because interest is paid twice a year (6 months apart). Thus, the annual market interest rate of 8% is also termed as a 4% semi-annual market interest rate. Note: We will be using this 4% semi-annual market interest rate on our Present value tables. 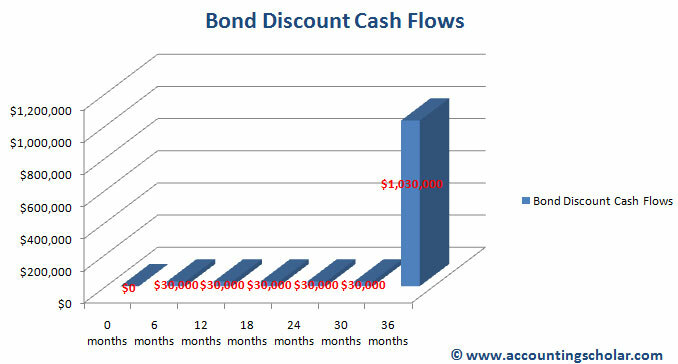 This graph shows the present value of a $1,000,000 lump sum bond payable discounted 3 years from now at a coupon rate of 6%. 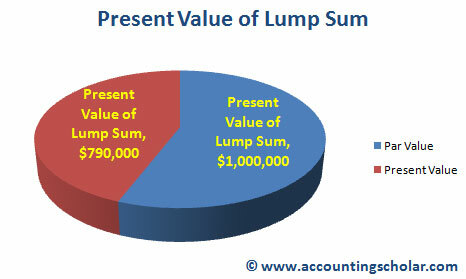 We see from the graph that the Par value is $1,000,000 while the present value of this par value is $790,000. The graph below shows the schedule of cash flows expected to be made from this bond. It includes $30,000 semi-annual interest payments for 3 years and $1,000,000 to be repaid back at the end of 3 years.